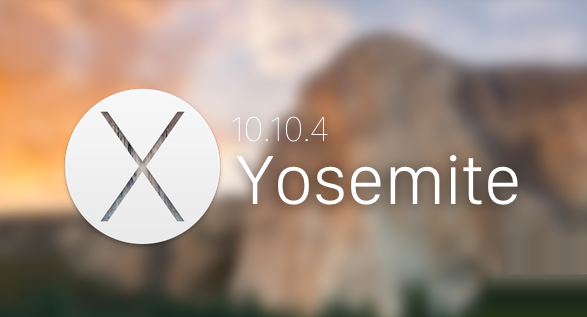 The official final version of OS X 10.10.4 Yosemite Update (Build: 14E46) for Mac has been released by Apple with Safari 8.0.7 for OS X 10.10.3+, Safari 7.1.7 for OS X 10.9.5+, and Safari 6.2.7 for OS X 10.8.5+ with Mac EFI Security Update 2015-001 and Security Update 2015-005 (May-2015) for OS X Mavericks and OS X Mountain Lion operating systems. The official Direct Download Links of OS X Yosemite 10.10.4 Final Setup / Update (Delta / Combo) .DMG Files for manual upgradation and installation are available. 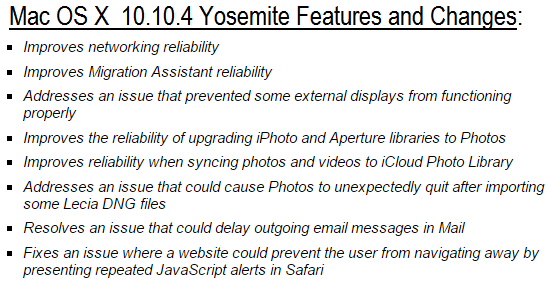 The release notes of OS X Yosemite 10.10.4 Final Update (14E46) contains; Replacement of “discoveryd” by “mDNSResponder” process to improve Wi-Fi network issues, bugs fixes, security, compatibility and stability enhancements etc. You can read Full OS X 10.10.4 Changelog in below image! How to Manually Install OS X 10.10.4 Update? To automatically receive official OS X Yosemite 10.10.4 Update instantly, you can navigate to Mac App Store >> Software Update option of your Mac PCs / Laptops. All OS X developers and non-developers (general public users) can free install OS X 10.10.4 via iTunes using Bootable USB or DVD after Download Final OS X 10.10.4 Setup / Update (Combo / Delta) DMG Files via Direct Links. For Apple guide, click here. Mac OS X Yosemite 10.10.4 Update is available in multiple different languages i.e. English, Arabic, Catalan, Chinese, Croatian, Czech, Danish, Dutch, Finnish, French, German, Greek, Hebrew, Hungarian, Indonesian, Italian, Japanese, Korean, Malay, Norwegian, Polish, Portuguese, Romanian, Russian, Slovak, Spanish, Swedish, Thai, Turkish, Ukrainian and Vietnamese. For installation, you must be running OS X Snow Leopard 10.6.8+ or newest mac operating systems.